Chemicals | CMI Marketing Sdn. Bhd. 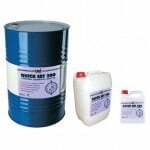 CMI QUICKSET 300 is a mortar plasticizing accelerator admixture for use in concrete / mortar mixes. When added, it accelerates cement hydration with improved workability resulting in shortened setting time and increased early strength. CMI WATERPROOF 310 is an admixture produced especially for the complete and permanent waterproofing of mass and reinforced concrete structures, ready-mixed and precast concrete, mortar screeds and etc.